On Friday we had a surprise birthday party for Bryson's grandma "Nonni" up at Big Springs Park in Provo Canyon. Her birthday isn't actually for another month, but the whole family was in town so we thought it would be the prime time to celebrate. 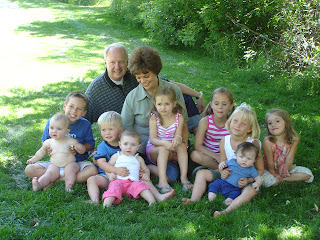 This is a cute picture of Unky and Nonni (Mike's parents) with their nine grandchildren.